It’s a fight Bob Arum has expressed a good deal of interest in making and now, due to the WBO installing Terence Crawford as the mandatory challenger for WBO welter ruler Jeff Horn, the fight is a big step closer towards taking place. As fans know, unbeaten Horn, who shocked superstar Manny Pacquiao to take the WBO 147 pound belt back in July, is set to make his first defence in December, against Britain’s once-beaten Gary Corcoran; the fight to go ahead in Brisbane, Australia. Corcoran is hugely confident going into the fight of his life but despite this, most if not all experts are picking “The Hornet” to win and retain his belt. 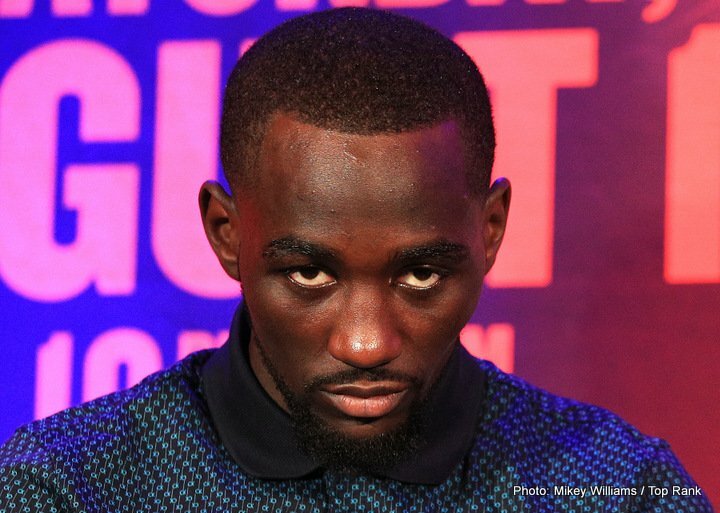 Crawford, who cleaned up the entire 140 pound division recently, soon made the decision to vacate his armful of titles and make the move up to the more action-packed, and lucrative, welterweight division. Crawford, if he can carry with him his special blend of speed, power, timing and general all-round excellence, could well go on to dominate the welterweight division the way he did the 140 pound weight class. For even if Horn, 17-0-1(11) again enjoys home country advantage in a fight with Crawford, he faces a tough, tough night. Horn is tough himself and as he showed against Pac Man, he can never, ever be written off, but it would take a pretty brave fan to bet on him seeing off Crawford. It could well be a good fight though, maybe even a great one. Or will Horn surprise us and opt to vacate the belt after the Corcoran fight (assuming he wins that one)? This scenario seems very unlikely as Horn is both a proud and determined WBO champion – as in determined to continue to upset the odds and keep a firm grip of the title he fought so hard to win in the summer. Again, Crawford would likely enter a fight with Horn as a substantial favourite, but with Horn we just never know. Maybe, just maybe, the Australian warrior will give Crawford the toughest fight of his hugely impressive 32-0(23) pro career. This match-up should be one to look forward to in the early part of 2018.